Who doesn't like bangers and mash? I mean, come on, seriously, it's bangers and mash! You've got to have it with onion gravy though, onion gravy, peas and mash that still has some texture left in it. To make onion gravy, I heat olive oil in a sauce pan and throw in sliced onions. Cover with a lid and allow to sweat for a minute or two. Now add a good slug of cider vinegar, a small amount of water, some sage leaves and season. At this point, cover it, turn the heat right down and let it sweat away. Brown some of your favoured sausages in a very hot pan, then add to the onions. This can be left covered on a low heat for fifteen minutes or until the sausages are cooked through. Mashed potatoes will always divide opinion. For me, it needs a good whack of white pepper, a small amount of milk and butter and a very light mashing. If you prefer it really smooth, I think a potato ricer and large balloon whisk are the best way to go. I've successfully paired this with Chimay Bleue in the past. Its a big beer, but the food is almost as big and can stand up to it. The beer starts with a sweetness that accents the sweet onions. There's a spicy, prickliness to the beer that cuts through any fat in the sausages. The woodiness of the sage and earthy quality of the meat is met by an underlying malty, earthiness in the beer. You then finish with a peppery tang that picks up the white pepper in the mash, and enough bitterness to clear the palate for the next mouthful. This is simple stuff, but great none the less. 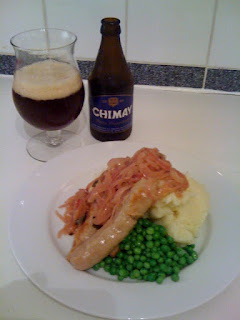 I think the Chimay Bleue in the picture above might've been a bit past it. You'd assume it would age quite well, but this one was a bit flat and lifeless.